Confidence is everything in hockey. Confidence impacts your performance more than any other mental factor. If you want to achieve all that you can in your sport, you must take necessary steps to foster your sports confidence. When you fertilize those seeds of doubt in your mind, they grow like weeds and dominate your thinking. Focusing on these negative thoughts results in one of two things: playing it safe or choking. Developing your confidence is vital to your growth within your sport. Confidence is the key to unlock your potential and produce consistent and optimal results in competitions. With some effort and diligence, you can develop your confidence and become the athlete you aspire to be. Taylor Hall is a left winger for the Edmonton Oilers, the first overall selection in the 2010 NHL draft, has steadily grown his confidence over the course of his career. Confidence has been the difference-maker that has helped Hall produce positive results on the ice. Thirty games into 2015-16 season, Hall is fourth in NHL scoring with 34 points and is playing with a high level of confidence. Hall has contributed to 40 percent (either assist or goal) of the 80 goals scored by the Oilers and has the best plus-minus rating (plus-15) of NHL player in the Top 10. Oilers general manager Peter Chiarelli has noted how Hall’s confidence positively affected his level of play during games. When you are confident in your abilities, instead of worrying about making mistakes, you can focus on converting opportunities during your shifts. Confidence allows you to see the ice better… You can anticipate plays and react quicker because you are not distracted by negative thoughts or over-analyzing your performance. Confidence allows you to take risks to raise your game to the next level without fearing failure. Hall believes that confidence is everything. Hall also understands there will be ups and downs which helps keep him motivated to play through the down times. Confidence is the source that pushes you to play at your highest level and make things happen on the ice. Change approach to games – Sometimes, just changing how you view something makes a dramatic improvement in how you perform. Instead of approaching competitions with that fear of failing, view competitions as a personal challenge similar to a CrossFit challenge. Tell yourself that it is these competitive challenges that help you grow your game. Stay focused on what you need to do to overcome these challenges. Sometimes, you may trip over a hurdle… get up and try again. Adopting “sport-as-a-challenge” mindset fosters your confidence, creates an excitement about playing and pushes you to take the risks needed to perform your best. How Can Hockey Players Stay Confident During Games? 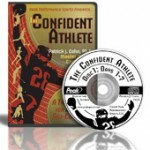 Our “Confident Athlete” CD and Workbook Program is 14 Days of Proven Confidence Boosting Techniques Guaranteed To Drastically Build Self-Confidence, Improve Sports Performance, and Stop Your Self-Doubt Forever!